The concept of Breath isn’t all that new. Oppressive government keeping secrets, while a group of rebels who know the truth work to set the people free. But Breathe takes it a step further. In the world Crossan created, it is not fear of the unknown that keeps people from revolting; it is fear of suffocating to death. 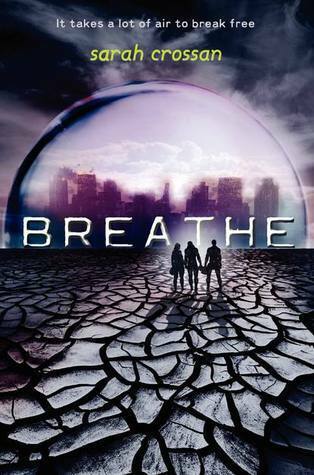 The people in Crossan’s world are ruled by their need for oxygen. The government doesn’t control the people using material items; they control the people by controlling a basic need. That’s that makes Breathe different. The story is told from the perspective of three different people. Bea, Quinn, and Alina start out without an alliance, but facing the outside world quickly makes them rethink their relationships. Bea and Quinn are best friends, but Bea is just waiting for Quinn to see her the same way she sees him. Quinn is attracted to Alina, but she doesn’t even entertain the thought. When the lives of these three people start moving forward together, everything they thought they knew is put to the test. Bea and Alina are considered part of what would be called the poor class. Life is tough for them, but they each make it work in their own way. Bea works hard in school, hoping to work her way up the ladder, even though she knows it’s a difficult road. Alina takes the rebel road, working against the government because she knows there is more to life than living inside the bubble. Quinn is one of the lucky ones, born into fortune, not really having to worry about getting enough oxygen. Even his life isn’t perfect, though, living under the shadow of his father. He never knows if he actually earns his praise, or if it only given because of his father. I was worried there would be an awkward love triangle when I first started reading, but I’m happy with how Crossan worked with having the three main characters. There’s a bit of a love triangle, but it doesn’t feel drawn out or forced. It’s flimsy and you know how things will end up. I liked how it was done. Breathe is a unique take on the dystopian story. It has high stakes that bring the intensity level up. I’m looking forward to seeing how Crossan takes the story forward. This entry was posted in Dystopia or Post-Apocalyptic, Something a Little Different, Young (and New) Adult and tagged Dystopia/Post Apocalyptic, Fantasy, Sarah Crossan.